Having sung in the Townsville Junior Choral Society and used the guitar to teach singing in his small schools across Queensland, Mike joined the Gold Coast based Banana Blenders as a Baritone in 1993. He performed with that Chorus in 7 of its 8 Gold Medal National Championship wins and has sung all voice parts. In 1999 he convened The Blenders first appearance at an International Convention in Anaheim Cal. and also competed in Denver in 2007. He was awarded Life Membership of the Blenders in 1999. Mike sang Baritone and then Lead with the quartet B Natural for 8 years before forming ESCAPADE, a quartet comprising great mates with a reputation for quality performances. ESCAPADE continues to compete nationally and in its 15th year performs gigs across Queensland . 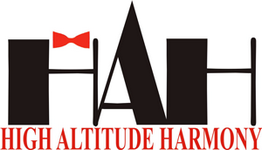 ESCAPADE was the guest quartet for the first night of High Altitude Harmony and the guys have supported Mike and HAH buy featuring on many performance programs. He has also won 2 National Seniors Quartet medals singing Tenor with Electric Canoe. Mike also coaches quartets. In September 2017 he led HAH to compete in Sydney at the combined BHA and Pan Pacific Convention. Mike currently sings Lead in Chorus and is passionate about fostering and supporting new members.